I attended the first day of For Noise Festival, in Lausanne-Pully on August 20 and there I saw the Canadian indie-rock/post-punk band Ought for the first time. They were awesome live and I really got into them and their gig. Eline Müller of Irascible Music spotted me in the crowd and asked me whether I wanted to interview them and I said “Yes, of course!”. So thanks to her for improvising the interview and thanks to Ought, of course, a bit shy at first then breaking the cocoon nut. 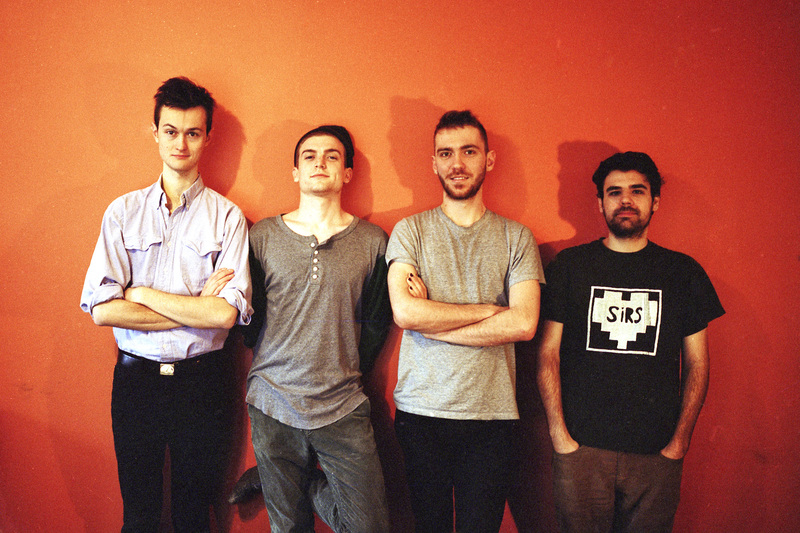 Ought are Tim Darcy (guitars, vocals), Matt May (keyboards), Ben Stidworthy (bass) and Tim Keen (drums, violin). The Liberation: So I just saw you playing before and I was stunned because it was so powerful and so cool. It was the first time I saw you so I was really impressed let’s say. I wanted to know if you consider your music as accessible to people since it’s a bit experimental but at other times it’s more indie-rock and so on. So what do you think about it? Is it easy for people to like it? Ought: I do, I think it’s accessible. I think that the barrier of what is required to make music inaccessible is quite high these days. People are willing to tolerate a very very broad range of tendency before something becomes like difficult. And I also think that we are relatively in a song convention. Like the music that we make is usually dozen DPA, usually far from rock idioms and from like that convention. So in terms of like believing… I don’t think we ask people to make a huge amount of work there. I mean there might be hopefully a little more work required with the new ones that it’s one of the subtle differences between this and like other rock scenes. But compared to what I would think of as difficult music or like inaccessible in music is that like it requires more effort in front of other things that I don’t think we need it. I don’t think you need a huge effort to get into our music. The Liberation: Ok, thanks. You’re signed to Constellation, which is a prestigious label from Montreal. Did this help promoting your music and your success? Ought : Yeah I mean I think that before they sort of got turned to us I don’t know if our ambitions really extended, personally I don’t know if they extended, as far as I guess we’ve come now. I think I have a very humble and small idea of what we are doing. So the support they’ve shown us has been very helpful and it’s definitely helped for a lot of opportunities that we had in different situations. The Liberation: OK. And do you feel a sort of pressure because you’re signed to such a prestigious label with many other big artists? Ought: I mean I guess yes and no, I’ve a lot of respect for the Constellation roster, I think like Motowma Roberts and Eric Shanoe and Jucely in my heart can be kind of intimidating and I feel like they’re making very challenging very interesting music. But also they’re just people. I don’t feel at any point like intimidated or feel nervous about living up to some legacy I just feel like the label encourages these people to just exploring the music they want to make. So I feel if anything were encouraged than they don’t want us to be something,they just want us to be us. The Liberation: So you have the freedom to be yourselves. The Liberation: That’s cool! Which bands influence your music the most? Ought (singer): Yeah. I think that’s a question we are asked in almost every interview I guess. We all listen to pretty different music so that’s kind of the all chemistry that happens in this band. Like everybody bring their own little pallet together so it’s almost weird to talk about band influences because we never had like a visioning moment of “This is how we want to sound like” at all. We just play lots and lots together, kind of incredible now. And then sort of like whittling something out of a very big piece of stone or whatever which is kind of chipped away until it’s kind of heck, so we start to form a set of songs. We kinda do that with every song I guess. And the exciting thing about that is that we don’t really have any set primaries for like what our next album will be or anything like that. It is an exciting environment to write in. There is some music coming from the Mini Mansions set, “Jesus what bass!” (all laugh). The Liberation: In which way is the Canadian public different than the one in Europe for example? Ought: Well our experience is different. I mean in Canada or in the States we are more likely to play with bands that we like know as people or like play in environments where we have a relationship with the people who come to the show. And this is only by circumstance that it’s gonna happen in Europe. It’s not so much that individuals are different but we’re thrown into totally different environments. If we go to Vancouver to play a show we’ll likely know someone there or even if we are not close it feels more dear and a little more low key. Whereas here in the shows we don’t have a personal relationship necessarily with people. But I don’t think the audience is different, we don’t experience it differently. The Liberation: Can you unveil a bit how your upcoming album is going to be? 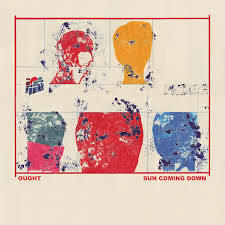 Ought (singer): Yeah it’s called Sun Coming Down, it’s coming out on September 18th. There are 8 tracks (laughs and all laugh) like the last time. And I don’t know yeah lot of people have said it sounds pretty different. I’ve heard people in the van talking about us like a sister record to the first record, theirs is certainly like overlap in themes and emotional backing to the songs and stuff. We’re just excited for it to come out. The Liberation: So do you feel you’ve grown with this new album? Ought (singer): Yeah definitely, I mean we play together so much since the last record came out. Even like two months in the touring of the last record the songs where just changing in so many ways since we recorded them. I think we wanted to think a lot more actively about the recording process with this record cuz we recorded the last one in three days. This is the only part of the interview that you’ll overhear (laughs). So yeah definitely like we’ve grown closer together as far as players and stuff and there’s a lot of room in that. Ought: One thing that is interesting that I was thinking about the last couple of days, I listened to the record the other day, I hadn’t listen to it in a while. There are lot of songs which are mid tempo which occupy this radio tempo that is not necessarily as charging as in the first record. People who heard the record talked about like a changing energy and I think there is like, at least personally, a desire to be able to congeal like intensity without necessarily mean it’s fast pieced. Or to congeal thickness without necessarily mean aggressiveness. I think a lot of the songs in this record have more subtlety to the way they present the thing they are doing. That it’s growth to me. That’s because it’s a complicated question like what does it mean to be growing and stuff so to make it more theoretical I’m trying to pass it out. The Liberation: That’s interesting! How does your composition process work? Do the lyrics or the music come first? Ought: Well I think it’s safe to say that all sounds really have come out just us being in a room all together and play, same for the first record. So we just kind of hold up in a space and play a lot. Sometimes we have good ideas sometimes we have really bad ideas. But when we find the ones that we like we kind of stick with it and start picking on the part, develop it and take it to where we think it’s an interesting place. My impression is that usually come sort of sometimes at the same time which is absolutely random, sometimes by reflection, you know practicing, or playing and listening to it later. Often does justice to your process! Totally. The Liberation: OK perfect! I’m done thanks a lot for your time!